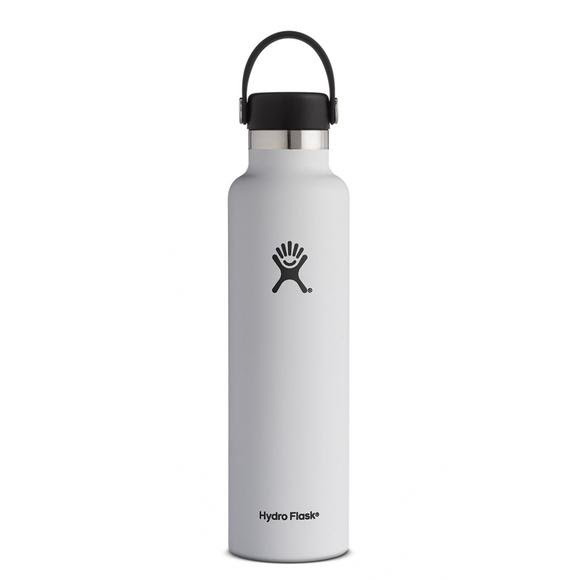 From mountain trailheads to morning yoga practice, Hydro Flask's 24 oz Standard Mouth Bottle makes it easy to stay hydrated before or after invigorating activity. Their largest Standard Mouth available, it's designed with professional-grade stainless steel and TempShield™ double wall insulation to keep your water refreshingly ice cold for up to 24 hours. From mountain trailheads to morning yoga practice, Hydro Flask &apos;s 24 oz Standard Mouth Bottle makes it easy to stay hydrated before or after invigorating activity. Their largest Standard Mouth available, it&apos;s designed with professional-grade stainless steel and TempShield™ double wall insulation to keep your water refreshingly ice cold for up to 24 hours. And, thanks to the sweat-free finish, your Hydro Flask bottle is guaranteed to stay dry even during big swings in the outside air temperature.